The UACJ Group is thankful for the earth and the abundance of life it supports, and recognizes that the fate of all living things hangs on the condition of the earth’s environment. Therefore, we see protection of the global environment and the promotion of a recycling-oriented society as one of our highest priorities and are committed to reducing environmental impact in all aspects of our business activities. We will make the necessary organizational arrangements and allocate the required management resources to advance activities that are cognizant of the need to protect the global environment. We will work to continuously improve the quality of our environmental protection activities by assessing the environmental impacts of our present and future business activities and using the results to establish technologically and economically practical environmental improvement measures and specific objectives. We will abide by environmental laws, regulations, and agreements, and formulate our own standards in actively working to protect the environment. At the same time, we will advance activities cognizant of the need to improve work environments, as well. We will work to reduce our resource and energy usage, promote recycling, reduce waste, and properly manage chemical substances in all aspects of our business activities, which extend to the environmental impacts of the products we handle. We will work to maintain or improve the environment by conducting environmental audits and constantly revising environmental management items and standards. We will work to raise environmental awareness among all of our employees by using internal Group-wide communications activities and other measures to promote understanding of our basic stance on the environment. We will contribute to and develop ties with local communities. Given our basic stance on the environment, as set forth above, we are pursuing the following activities. Continuous improvement and enhancement of our environmental stewardship through the application of an environmental management system. Steps to enlighten all employees and raise their awareness on environmental matters. Contributions to and ties with local communities. *2 The PRTR (Pollutant Release and Transfer Register) Law promotes improvement in the determination and control of amounts of designated chemical substances released into the environment. * Efforts will focus on chemical substances with the largest environmental impacts on a production-site basis. To advance environmental activities and raise the environmental awareness of employees, the UACJ Group has established the Environmental Committee as a body that represents the entirety of the Group. 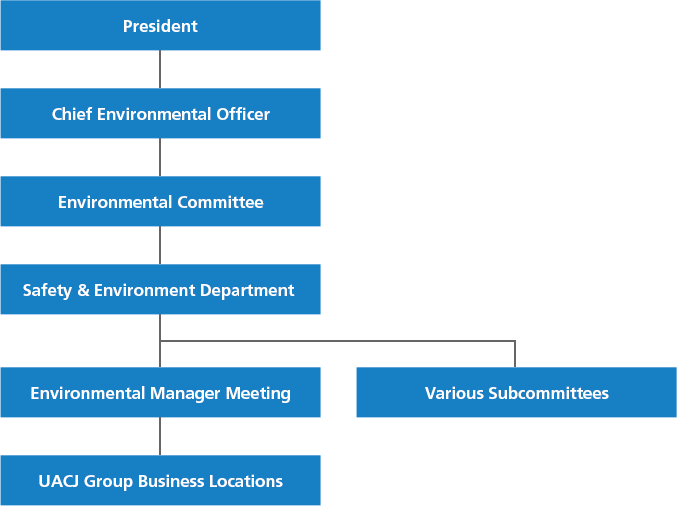 The Environmental Committee, chaired by the Chief Environmental Officer, has a membership consisting of UACJ executives, plant managers, and presidents of principal Group companies . The committee meets once a year, in principle, to be updated on the status of environmental activities, and discuss aims and objectives for the following fiscal year’s environmental activities. To link environmental activity objectives with business activities and reliably work for their achievement, we have established the Safety & Environment Department as a unit responsible for implementation. The Safety & Environment Department holds meetings for Environmental Managers, conducts Executive Environmental Inspections, and organizes subcommittees on topics such as industrial waste and energy saving in performing the function of implementing and refining environmental activities. The Environmental Managers of UACJ’s four main works, and principal extrusion, foil manufacturing, copper tube, and precision-machined components plants come together in meetings where they review progress in achieving the UACJ Group’s environmental objectives, and share information on matters like changes in relevant laws. Environmental management systems are in place at each of the UACJ Group’s business locations, and nearly all of our plants have obtained the ISO14001 certification. Some of our smaller business locations have obtained the Eco-Action 21 certification by following the guidelines formulated by Japan’s Ministry of the Environment. Following the September 2015 issuance of the updated ISO14001 standard, each business location worked to achieve compliance with the new standard. All locations successfully updated their certifications as of the July 2018 deadline for doing so. Executive Environmental Inspections are carried out at Group business locations in Japan to prevent environmental problems, propose and advance implementation of measures for eliminating or mitigating risk, and ensure thorough compliance with environmental laws and regulations. The inspection team, consisting of the Chief Environmental Officer and representatives from the Safety & Environment Department, visits business locations, receives reports on local environmental management, and checks local conditions in gathering information on matters such as legal and regulatory compliance, and the status of improvement activities. When matters requiring improvement are identified, the Safety & Environment Department provides guidance and support in taking the necessary corrective action. Through this approach, the quality of environmental management throughout the Group is being raised from the bottom up. In fiscal 2017, Executive Environmental Inspections were conducted at a total of 14 business locations. In fiscal 2017, there was one accident in which an environmental wastewater standard was violated. On September 17, 2017, a release of wastewater with a pH (the standard for hydrogen ion concentration) of 8.7 occurred at UACJ Copper Tube Corporation’s plant. The standard calls for a pH of 5.8 to 8.6, and the release was into a river. The accident was caused by the growth of algae in a pond on the plant grounds and the consumption of CO2 as a result of photosynthesis. This was a natural phenomenon that occurred during a brief period of time and there were no impacts on the river. To prevent a recurrence, measures are being developed to control the growth of algae. The UACJ Group’s fiscal 2017 environment-related investments totaled approximately 1.1 billion yen. These funds were used for purposes such as updating electrical equipment for hot-rolling facilities and adding electrostatic precipitators at the Nagoya Works, updating the wastewater treatment facility at the Fukaya Works, and switching to LED lighting fixtures at various business locations. We conduct environmental education for all employees as another measure for fulfilling our social responsibility to protect the global environment. The Safety & Environment Department and the environment units of individual business locations lead environmental education initiatives. The Safety & Environment Department conducts fundamental environmental education activities, the purposes of which are to enlighten and raise awareness of environmental protection, and promote understanding of the UACJ Group’s Basic Stance on the Environment. Meanwhile, the environment units of individual business locations carry out environmental education initiatives to foster the skills and numbers of internal auditors needed to ensure that each business location conducts its daily activities with sensitivity toward the environment. In fiscal 2016, internal auditor training also included content on changes included in the 2015 edition of the ISO14001 standard. We encourage employees to obtain public qualifications in environmental fields and are developing a workforce that is capable of appropriately responding to trends in environmental regulation. Individual business locations conduct general environmental education programs and special education programs for employees engaged in work that could have significant environmental impacts. * Data are for UACJ and Group companies in Japan. The UACJ Group views the protection of biodiversity as one of the most important global environmental challenges, and we treat it as such within the UACJ Group Code of Conduct. Though the UACJ Group’s business model does not have a significant direct impact on biodiversity, we engage in actions we believe will help protect it. Examples of these actions, taken at individual business locations, are given below. The UACJ Group’s customer base includes a significant number of manufacturers who export products to destinations outside Japan. This is one reason why we are keenly aware of the importance of supply-chain management. We take steps to ensure that the raw metals we use include no conflict mineral*1. And we exercise stringent measures to comply with the European Union’s REACH*2 regulation and RoHS*3 directive, and ensure that our products contain no controlled substances. Furthermore, we make a point of responding appropriately when customers request us to complete a green procurement survey. *1 Conflict minerals are minerals subject to conflict mineral disclosure regulations under the US Dodd-Frank Act. These minerals include tin, tantalum, tungsten, and gold mined in the Democratic Republic of the Congo or neighboring countries. *3 The EU’s RoHS directive requires the “Restriction of Hazardous Substances” and was issued by the European Parliament and the European Council to restrict the use of certain hazardous substances in electrical and electronic devices.